White Oak Pastures ships products all over the United States. However, there are deliveries made closer to home and Marty Brown is the man we depend on to deliver our products. He travels to Atlanta twice a week and to Sebring, Florida where our cowhides are tanned. Marty makes a return trip to bring our hides back, where they are sold in our leather shop. He makes special deliveries to Eva and Auburn, Alabama and has traveled as far as Tennessee. Marty is also responsible for retrieving miscellaneous items needed on the farm, which could take him anywhere. 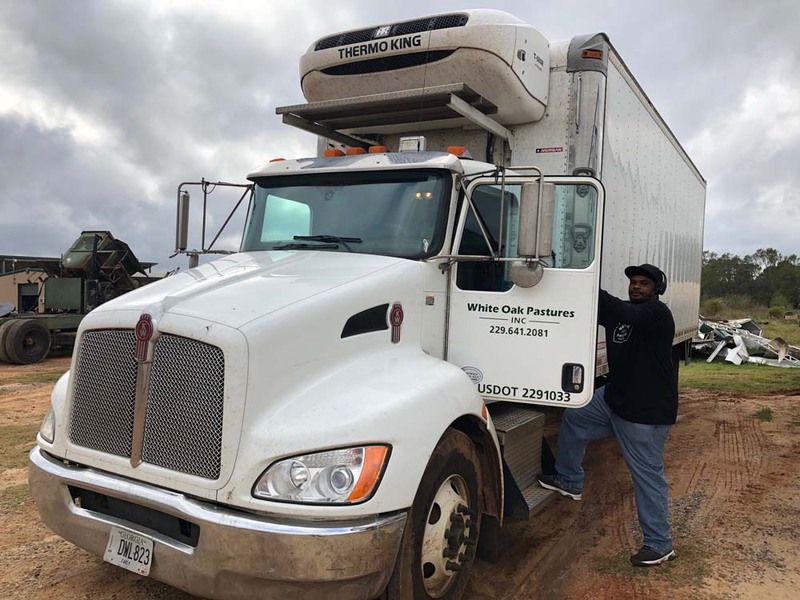 While driving a truck does not seem out of the ordinary, Marty describes White Oak Pastures as “different”. When asked to describe different aspects of the farm, he stated, “there is just too much to explain.” He did disclose that one of the funniest incidents he witnessed on the farm was when a friend was challenged to swallow a grub worm. Everything on this farm grows bigger, hardier, and healthier than plants and animals on industrial farms, and the grubs are no different. Marty said that his friend just could not accept the challenge because that grub was as big around as his thumb! Marty began driving trucks while working at Three Notch Power Company when he was eighteen years old. He was promoted to a lineman’s position and worked there a total of fourteen and a half years. 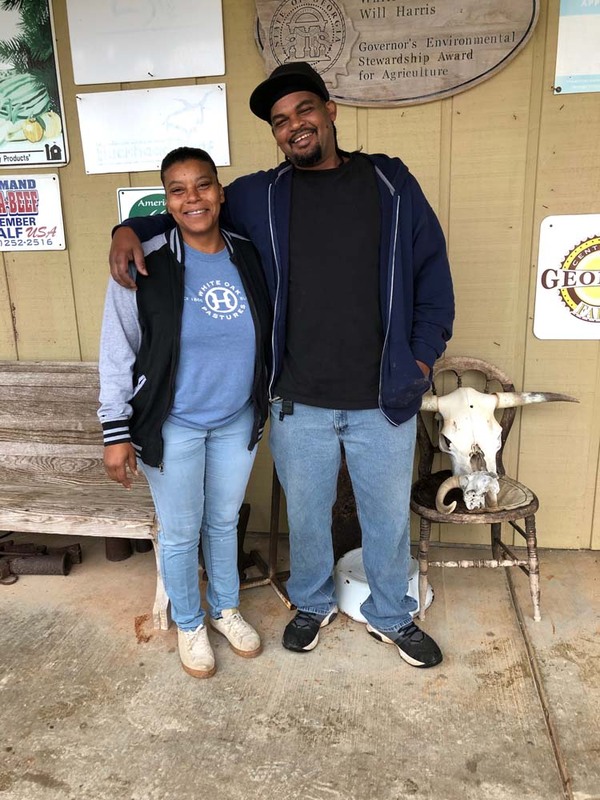 Marty’s sister, Lisa Brown, our poultry plant manager, told Marty that White Oak Pastures had a driver’s position available. 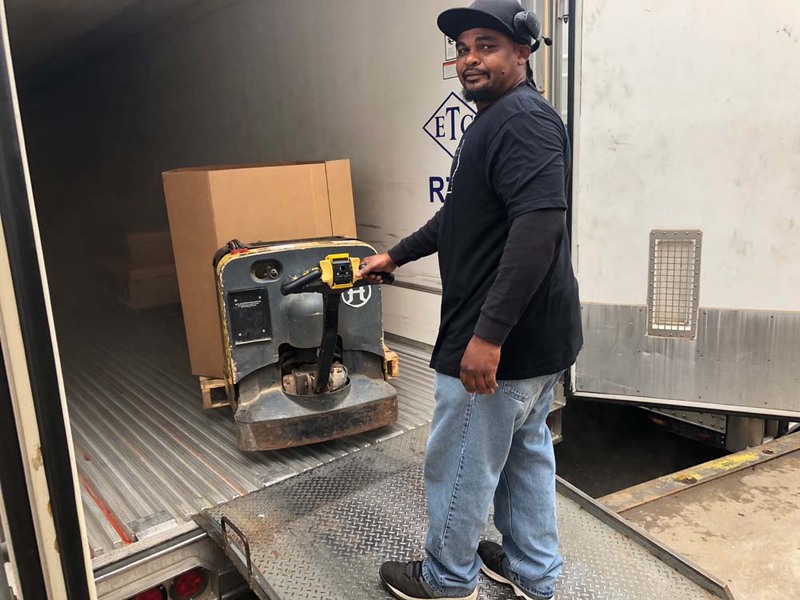 “I got a call from ‘Buck’ (our red meat abattoir manager) one day asking me if I would drive the ‘box’ truck.” Although driving a big truck through Atlanta and getting stuck in traffic is an inconvenience, Marty doesn’t mind being by himself because he is doing something he enjoys. Marty is so content with his position, he is staying right where he is! Being chosen as the Employee Of The Month is Marty’s proudest moment here on the farm. He enjoys eating beef tips and rice at our Dining Pavilion located behind our red meat and chicken abattoirs. However, if he is eating at home, he is going to take White Oak Pastures’ pork chops and fry them up and smother them in gravy. It’s a Southern thing. Away from the farm, Marty enjoys gardening. One of the things he likes about living in South Georgia is “we never have any bad weather”, except recently. The hurricanes wreaked havoc on his yard, but he intends to repair, replant, and receive the honor of Yard Of The Month! He could live without the gnats, though. Marty has four sisters, three brothers, six children, and two grandchildren that he loves to play with. He proudly shared “we all love each other,” which speaks volumes about the kind of man he is and sets a fine example for the rest of us.